The history of Formula 1 has been littered with deals that looked good on paper but turned out to be utter disasters in practice, often at times of great technological upheaval. One such occasion occurred when the FIA decided to phase out turbo engines in the late 1980’s, with teams rushing to secure engine deals – some, like March’s deal with Judd, out of choice and some, like Williams’s temporary deal with Judd, out of necessity after Honda moved to McLaren. With the new regulations came a range of new manufacturers and independent suppliers, all looking to capitalise on the situation. Judd entered the fray with the CV V8, a stretched version of their BV F3000 engine, whilst the Ford-Cosworth engineering partnership would return with the DFZ, a stopgap which carried over the basic layout of the DFY engine (although little else would be carried over) whilst the DFR was under development. For all but the largest teams, most of whom formed partnerships with major manufacturers, the Judd and Ford-Cosworth engines would be popular options due to their reasonable fuel consumption, relative cheapness and compact nature. There would be two notable exceptions, however. In both instances, the teams would form partnerships with manufacturers looking for a burst of publicity. One was Larrousse, which would form a partnership with Lamborghini on the back of a marketing initiative from Chrysler. The other was Erich Zakowski ‘s Zakspeed team, which would form an alliance with Japanese engineering conglomerate Yamaha. To outside observers, it must have looked like Zakspeed had pulled off something of a coup; Yamaha were offering Zakspeed a lucrative, exclusive, engine supply deal, whilst the engine itself on the surface seemed to be a technologically advanced design, especially on the back of Yamaha’s performance in F3000 with advanced cylinder head valve technology. A Yamaha engine powers Aguri Suzuki to the 1988 All-Japan F3000 championship title. The story of the inception of Yamaha’s OX88 F1 engine actually began a number of years earlier with the FIA deciding to introduce a new junior racing series in 1985, Formula 3000, to replace the declining Formula 2 series. With the F3000 regulations effectively written around a detuned version of the Cosworth DFV (with the FIA imposing a 9,000 rpm limit to cap power), Cosworth lost no time in adapting their engines for F3000, modifying the valve timing and the intake/exhaust ports accordingly. However, whilst the European racing series changed their regulations immediately, in some regions the regulations would take longer to filter through. Over in Japan, the Formula Nippon series would stick with the old Formula 2 engine regulations until the end of the 1986 season, perhaps in part because of the influence of Honda (given that their works engine was dominating F2 shortly before its collapse) and Yamaha, whose OX66 engine was reasonably competitive. In 1987, the Japanese Automobile Federation decided to move towards the International F3000 regulations, giving Cosworth an opportunity to move into the Japanese racing arena at the same time as Yamaha was looking for a development partner. Although Cosworth started out supplying its own engines, over the course of the 1987 season Cosworth and Yamaha would start working together to counter Honda, with Yamaha offering its experience in advanced cylinder head designs based on research from its automotive and motorcycle divisions. In 1988 the strategic partnership would continue with the two outfits collaborating on the design of the OX77, a 90-degree V8 engine that was effectively a Cosworth DFV with Yamaha’s distinctive five valve cylinder head, intended to improve the power output and fuel efficiency of the modified DFV. In a tight championship battle, development work on the Cosworth-Yamaha engine paid off, with Aguri Suzuki and his Footwork team narrowly winning the championship that year in a field mostly filled with Mugen-Honda engines. On the back of their close collaboration and success in the Formula Nippon series, Yamaha began to consider whether it could apply its technological expertise to Cosworth’s Formula 1 engine program. In 1988, Yamaha decided to broach the subject by offering Cosworth a modified version of their OX77’s five valve cylinder head for their DFR, which they believed would outperform the standard four valve cylinder head Cosworth were using at the time. Cosworth were sceptical from the beginning; Yamaha’s design, whilst offering a theoretical performance gain, was more complicated and heavier than their conventional four valve design, whilst a number of Cosworth’s engineers questioned whether the design was robust enough to last a full GP race distance (Formula Nippon races being much shorter than a full GP race distance). The Yamaha motor is ready to rumble in the back of the Zakspeed. Nevertheless, Cosworth agreed to test Yamaha’s design on an adapted DFR engine with engine dyno tests to determine whether Yamaha’s design really would outperform the conventional design. Sadly for Yamaha, the engine dyno test would go disastrously wrong; a catastrophic valve failure caused the test engine to fail prematurely, whilst the data that Cosworth was able to salvage indicated that the new cylinder head design offered none of the claimed power benefits over their own four valve design. Unsurprisingly, Cosworth rather bluntly rejected Yamaha’s design after that incident; Yamaha’s response was to try to prove Cosworth were wrong by beating the DFR on the track in Formula One for itself. Deciding to work from an existing design, Yamaha turned to the two most relevant engines that they had to work from – the OX77 and OX66 engines they had been using in Formula Nippon for the past few years. The final design of the OX88, whilst carrying over a number of features from the OX77 (and, indirectly, the DFV), nevertheless featured a number of major departures. Like Judd, who introduced the EV series engine for 1989, Yamaha decided that they would reduce the cylinder bank angle from 90 degrees to 75 degrees. Although this would cause problems with the mechanical balance of the engine and raise the centre of gravity, this would make packaging of the ancillary components more convenient. Further tweaks would be made to the shape of the combustion chamber to account for the change in the intake valves and positioning of the spark plug, which had to be offset slightly from its original position to accommodate the additional intake valve. And in an effort to improve durability, the cylinder head valves would now be manufactured from titanium, although most of the engine would be a mixture of aluminium and steel alloys that were carried over from the OX77 and OX66 (and the DFV). Using conventional aluminium alloys rather than magnesium alloys meant that the OX88 did have a slight weight penalty compared to its rivals, weighing in at around 145kg, fractionally heavier than a DFR, albeit not disastrously so. Now that the engine was complete, all that remained was for Yamaha to find a team that was willing to use their engine – and at this point an opening came up with Zakowski’s team. Bernd Schneider qualified the Zakspeed 891 Yamaha for the 1989 season opener in Brazil, but it was a false dawn. Having struggled through the 1988 season with their own antiquated turbo engine and outdated chassis, Zakspeed could start afresh in 1989, but the change to normally aspirated engines posed a problem. Unlike the turbo engine, which had been derived from Ford’s BDA engine, Zakspeed lacked the resources to build its own non-turbo powerplant, and needed to sign an engine supply deal with an outside supplier. With Zakspeed’s finances limited after their poor performance in 1988, it looked like they would have considerable difficulty securing an engine deal, whilst their strained relationship with Cosworth (having formerly competed against them to develop an F1 spec turbo engine for Ford) made matters worse. In that context, Yamaha’s offer of full works support and an exclusive engine deal must have looked like a dream come true for a team looking for ways to make ends meet and boost their competitiveness. And certainly any edge would have been welcome, with the entry list containing 20 teams and 39 cars, and Zakspeed consigned to the maelstrom of pre-qualifying. Nevertheless, on paper the team must have initially been reasonably confident. The claimed power output of the OX88, at 600 bhp, was comparable with the Judd and Cosworth customer engines, whilst the team had well-regarded engineering staff even if the 891 chassis was a relatively conservative design. Bernd Schneider remained in the driving line-up, joined by Yamaha’s favoured driver Suzuki, but pre-season testing got off to a bad start at Vallelunga where Zakspeed were only able to complete 25 laps in four days. Worse was to come at Paul Ricard; teething problems for the OX88 might have been expected given that it was a relatively new design (albeit based off old technology), but in France the team would be beset by repeated problems and mechanical breakdowns. Much as Cosworth had anticipated, Yamaha were having considerable problems in making their new intake/exhaust valves last a full race distance due to inadequate cooling, whilst more issues cropped up due to the design of the timing belt (which was being used to drive the oil and water pumps) whenever there were fluctuations in engine load. Some external observers began questioning Yamaha’s choice of materials and the quality of their workmanship. Further questions would be raised about the true power output of the OX88; Yamaha would revise it down from 600 to 560bhp. For a manufacturer backed engine, this was lacklustre given that the customer Judd and Cosworth motors were producing around 600-610 bhp and the leading powerplants were producing in excess of 650bhp. Finally, the power band of the engine turned out to be narrower than anticipated, whilst the retention of the flat plane crankshaft design of the DFV caused endless issues with mechanical balance (or the lack thereof) at high rpm, compromising reliability. Aguri Suzuki never came close to getting past pre-qualifying throughout 1989. If Paul Ricard proved to be difficult enough, the problems only became worse when the teams moved to Rio de Janeiro for the final pre-season test at Jacarepagua. With high air temperatures and the notoriously rough surface putting a lot of strain on the power trains of the cars, the highly strung OX88 suffered breakdown after breakdown. With eight recorded engine failures, including one particularly embarrassing episode when one motor detonated within 5 seconds whilst idling in the pit lane, Zakspeed effectively had to write off the entire test after being able to complete only a handful of laps at a time. This was a major problem; the lack of track time effectively prevented them from testing any upgrades, and both Suzuki and Schneider were struggling to get to grips with a car they had barely driven. It was clear that pre-qualifying was going to be an uphill struggle. Sure enough Suzuki was three seconds slower than Schneider, who had just managed to record the 5th fastest time in pre-qualifying and get into the main qualifying sessions, but his chances of actually making the grid looked quite slim. But several strokes of luck involving problems for other drivers saw Schneider and the Zakspeed-Yamaha make it onto the grid in 25th place. During the race itself, although the German was around five second a lap off the pace of the leaders he was at least managing to keep Philippe Alliot’s Larrousse at bay, and despite the extremely hot conditions the car, surprisingly, was holding together – until Eddie Cheever collided with Schneider whilst lapping him, taking both drivers out of the race. Although Schneider might have dragged the 891 and the OX88 engine onto the grid in Brazil, the next race in San Marino gave a much more accurate reflection of the competitiveness of the team when Suzuki and Schneider, in that order, were 11th and 12th only in pre-qualifying. For much of the remainder of the season, the combination of poor acceleration due to a lack of torque in the lower rev range, coupled to their power deficit, meant that the Zakspeeds were routinely in the bottom half of pre-qualifying, even though reliability had improved somewhat. Problems within the team started mounting fast, with several sponsors of the team in open revolt over the string of poor results. In August, however, would come the biggest body blow; the owners of the West tobacco brand announced that they would not be renewing their contract, a decision they claimed was based on Zakspeed’s poor performance. With Zakspeed wholly reliant on that one sponsorship deal, the chances of the team surviving 1990 looked increasingly bleak. As it was, Schneider’s labours with the uncompetitive car would eventually be rewarded with a surprisingly strong result in Japan, although some might cynically suggest that Yamaha put in more effort than normal with their engines for what was their home race. Third fastest in pre-qualifying, Schenider went on to set a surprisingly quick time of 1m42.9s in the main sessions, fast enough for 21st on the grid and in the process beating several much more fancied runners including Emanuele Pirro’s Benetton, both Arrows drivers, and Jonathan Palmer’s Tyrrell. End of the road: with the West sponsorship having disappeared, Schneider tests a plain white 891B at Estoril after the end of the 1989 season. Sadly for Schneider, any hope of actually finishing the race promptly went up in smoke after just a single lap when his gearbox failed, leaving the team with nothing to show for all their hard work. With the team failing to get through into the final pre-qualifying session in Australia by the best part of 0.7s, they limped back to base in Germany, facing an uphill struggle for their survival. 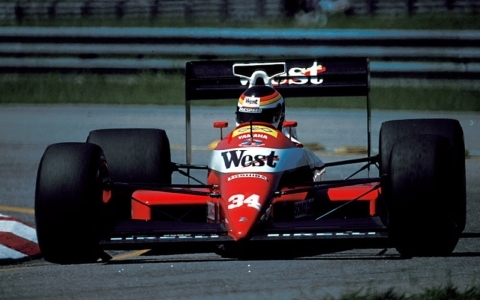 Zakspeed too had every intention to continue despite West’s withdrawal. The team put together a test hack, known as the 891B, to test a modified version of the Yamaha engine at Estoril and Paul Ricard in January 1990. Turning up with a plain white livery now that most of the teams sponsors had deserted them, at Estoril the team lapped 7 seconds faster than in pre-qualifying for the Portuguese GP, so there was definitely improvement. But disappointingly the modified OX88 was still unreliable, with more engine failures limiting them to a mere 20 laps over two days. At this point Yamaha, presumably embarrassed by the spate of retirements, cancelled the OX88 program and started working on a replacement engine, the OX99 V12 that would eventually make its appearance on the grid with Brabham in 1991. But Yamaha would continue to under-deliver, their motors severely compromising Brabham’s season in 1991, Jordan’s season in 1992, and Tyrrell’s season in 1993, before finally achieving a respectable level of competitiveness with Tyrrell from 1994 to 1996 and Arrows in 1997. With Zakspeed now left without any engines, sponsors or money, Zakowski was left with no option but to shut down his F1 team. In retrospect, although Yamaha’s concept of a five valve cylinder head was explored by other outfits at the time (such as Lotus’s attempts with Tickford to design a new cylinder head to overcome the limitations of their customer Judd engines), only Ferrari, with the resources and commitment of Fiat, were ever able to produce a competitive five valve design. In the end, although Yamaha’s concept had merit in theory if nothing else, a lack of experience, an underestimation of the job at hand, insufficient resources, and too many compromises meant that the Japanese manufacturer failed to capitalise on their ideas. Yamaha’s abortive V8 engine program and the collaboration with Zakspeed had been nothing short of a underpowered, unreliable disaster.